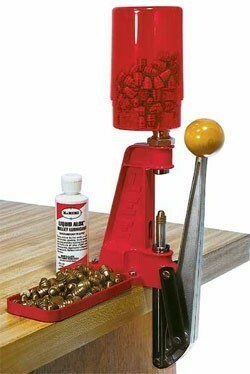 Fastest and easiest way to lubricate and size cast bullets. Standard 7-8x14" threads fit any single stage reloading press. Bullets are pushed through the sizing die nose first, so no special nose punches are needed. Gas checks are automatically seated and crimped in place. Sized bullets are captured in the special container. Intended for use on Single Stage Presses ONLY. The push through Punch is used in place of a Shell Holder in the Ram. Lee does not make top punches for molds. With the use of this kit, a top punch is not necessary. To crimp gas checks with the lube and size kit, first lubricate the bullets with liquid alox, push a gas check on the base of the bullet and set the bullet on the punch. When the bullet is pushed through the sizing die, the bullet will be sized, and the gas check will be crimped on. For cast bullets, you want to select a sizing kit to be .001" larger than groove diameter. If your diameter is not listed below, place an order for a custom size.